There are various local websites that have a great deal of fascinating information regarding the maritime history of the area (see the list lower below). Occasionally, due to a combination of weather conditions over a period of time and big spring tides, we can sometimes see evidence of some of the shipwrecks that have taken place. 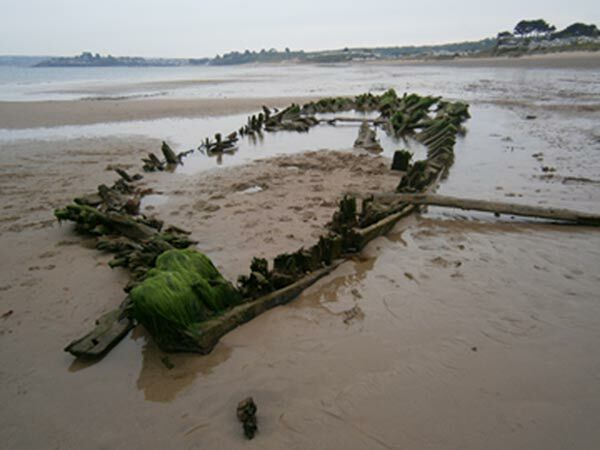 An example of this is the vessel "Fossil" which was wrecked in a gale in 1902 on the Warren beach and this wreck was exposed in 2013 (see the photo by Keith Roberts below). This vesel was apparently carrying slate. A local museum and a rich resource of information from some local experts.